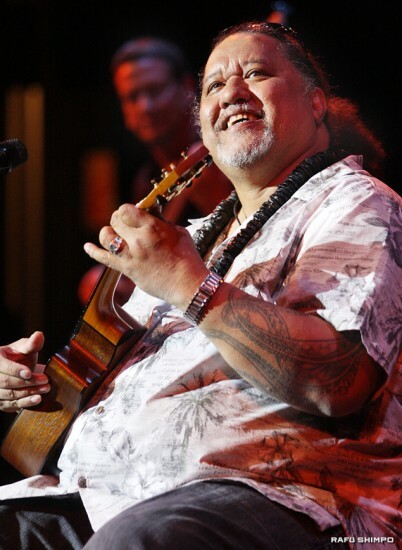 Willie K performed to a full house at the Aratani Theatre (formerly the Japan America Theatre) in Little Tokyo on March 12, kicking off a series of concerts designed to attract new audiences to the 880-seat venue. The Hawaii-based musician, a 40-year veteran of the stage, sang and played ukulele, acoustic guitar and electric guitar in a variety of styles — blues, Italian opera, a jazzy version of “Over the Rainbow,” and even theme songs from old samurai TV dramas — while keeping the audience entertained with jokes and anecdotes. Willie K was accompanied by Jerry Byers on bass and Kris Thomas on drums. 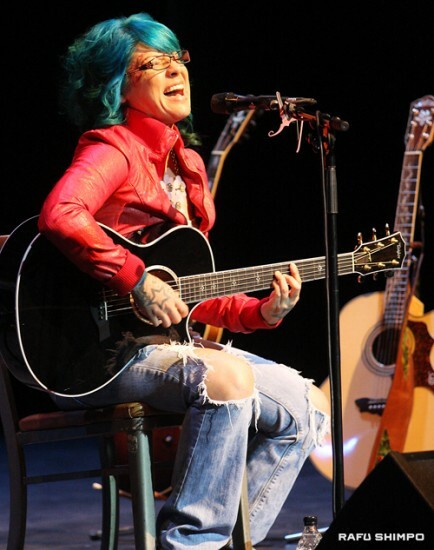 The opening act, also from Hawaii, was singer/songwriter Yoza, who fuses hip-hop, R&B and Latin influences into “acoustic soul.” She was invited by Willie K to perform. During the show, Willie K introduced two other special guests from Hawaii, former Miss Universe Brook Lee and comedian/actor Andy Bumatai. Gerald Ishibashi (right) of Stonebridge Productions, who organized the series, said, “We’re charting a different course. Were changing things up, rebranding, reconfiguring, re-energizing, and with your help we’ll reignite this place.” He announced upcoming concerts by The Association on April 20, Keiko Matsui and Jeff Kashiwa on May 25, and Kalapana and Carlos the Experience on Aug. 17. 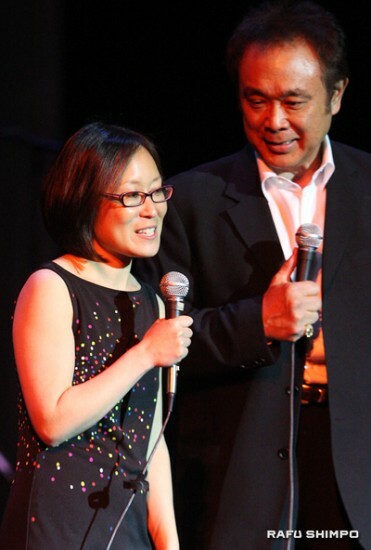 His daughter, actress Brittany Ishibashi, announced that two Willie K ukuleles will be signed by all of the artists and auctioned off at the end of the series. Leslie Ito (left), the new CEO of the Japanese American Cultural and Community Center, said, “This theater means so much to me, growing up here first as a theater usher and an intern, and I hope that you all can create memories the way I have here.” She urged everyone to support the JACCC by becoming members. For more information, visit www.jaccc.org.